Hungary, Kazakhstan to further deepen economic ties – Törökszentmiklósi Mezőgazdasági Zrt. 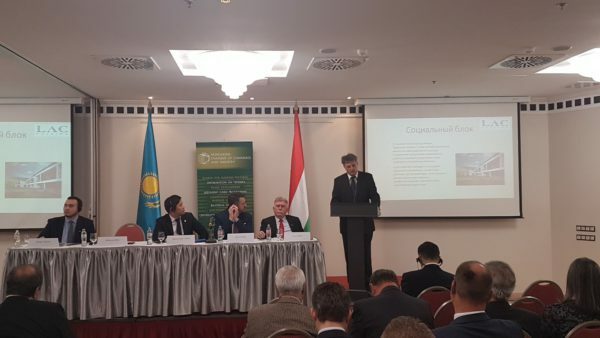 On November 22, the Hungarian Chamber of Commerce and Industry (MKIK) held the sixth joint meeting and business forum of the Hungarian-Kazakh Business Council. The event was welcomed by Minister of Finance Mihaly Varga, National Economy Minister of Kazakhstan Timur Suleimenov, President of the Hungarian-Kazakh Business Council László Horváth, and President of the Kazakh-Hungarian Business Council Sarsenov Jambulat. Subsequently, several bilateral agreements were signed. Namely, between Kazakhstan and Kazakh-Hungarian Business Council, between IFUA Horváth and Partners Kft. and Kazenergy, and also between LAC Holding Zrt. and Kazakhstan Sports Medicine Association. The closing part of the event was dedicated to lectures and bilateral meetings of participants. In August 2012, the Hungarian Chamber of Commerce and Industry established the Hungarian-Kazakh Section with the participation of 45 Hungarian companies, whose main objective is to facilitate the entry of Hungarian companies into the Kazakh market. Currently, there are 70 member companies. In Kazakhstan, the Kazakh-Hungarian Business Council was established in 2013 as direct partner of the Hungarian-Kazakh Section, chaired by the President of Kazenergy Sarsenov Jambulat. Hungarian Co-President of the Hungarian-Kazakh Business Council is László Horváth who is the CEO of LAC Holding Zrt. The establishment of the Business Council was an important step towards the development of Hungarian-Kazakh economic relations. In his speech, László Horváth noted that huge opportunities lies ahead for Hungarian companies in Kazakhstan, mostly in energy, agriculture, tourism sectors, pharmaceutical industry, as well as in water management, waste management and agricultural IT areas. The Kazakh-Hungarian commercial offices, which operate both in Astana and Almaty, are willing to assist the companies involved. 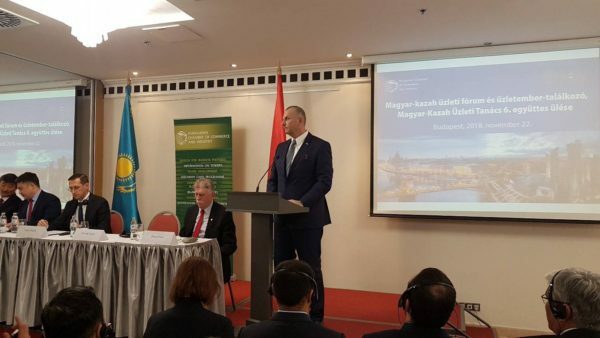 Mr Horváth highlighted some significant achievements in the Hungarian agriculture: based on the fact that Hungary is among the world leaders in seed production, a significant program has been launched to establish Hungarian seed institutes in Kazakhstan. Its first result is already tangible: the stock has been significantly increased. The next step is to involve more lands of different sizes under cultivation. Here, Mr Horváth mentioned the Pannon Breeding program, in which more than 160 researchers from almost all agricultural research institutes and universities of Hungary conduct horticultural researches. Along with this, a cooperation agreement was signed in Almaty with partner Kazakh research institutes. Last but not least, Mr Horváth pointed out that there are huge opportunities for IT companies in the agricultural sector in Kazakhstan and LAC Holding Zrt. is willing to assist companies to exploit these opportunities. In his speech, Agricultural Director of LAC Holding Zrt. Péter Miskucza, presented the facts and opportunities of bilateral cooperation between Hungary and Kazakhstan based on the experiences of LAC Holding Zrt. In his lecture he highlighted the significance of the seeds, especially maize, pointed out Hungary’s location in world seed production, introduced the Pannon Breeding program and the 4Cube Project. The aim of the 4Cube Project is to establish agricultural sample sites on around 10 hectares which is capable to supply 10-30 thousand hectares of agricultural lands. The agricultural centre consists of the following parts: cleaning-drying-storage complex, agricultural machinery park, service-sales centre and social block. Next day, on 23 November, the business meeting continued with a plenary session. The results of the foregoing bilateral economic cooperation and the opportunities for future cooperation were reviewed. 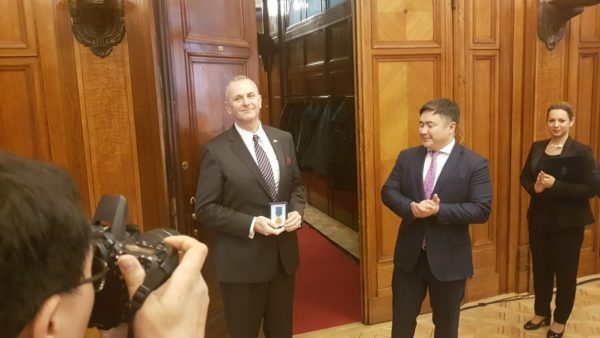 At the end of the meeting, presidential award was handed over to László Horváth, Co-Chairman of the Hungarian-Kazakh Business Council by Sarsenov Jambulat, President of the Kazakh-Hungarian Business Council for his active participation in the promotion of the Hungarian-Kazakh relations for 25 years.